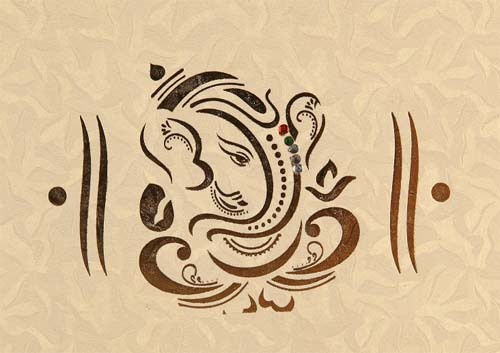 Lord Ganesha’s picture is always printed on the cover of Hindu wedding cards. But why is Lord Ganesh picture printed and not of any other Hindu Gods. The reason is that Lord Shiva had given Ganesha the boon that no ceremony or function should be conducted without first invoking Ganesha. For a ceremony to be successful His blessings are necessary. All other deities give their blessing only after Ganesha gives consent to the ceremony. Hindus also believe Lord Ganesha will clear all the obstructions and hurdles in an auspicious event like marriage. He also blesses the couple with prosperity and happiness. Ganesha is also known as Mangal Murti. Therefore his presence on the card signifies auspiciousness. The picture is also a symbol to suggest that the marriage will be held as per Hindu religious tradition and customs. Again in many regions, Ganesha Puja (Ganapati Homam) is performed couple of weeks before the marriage ceremony. The puja is performed to remove all obstacles and to have a peaceful and happy wedding.